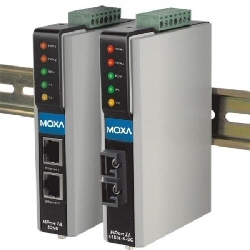 NPort IA device servers deliver easy and reliable serial-to-Ethernet connectivity for the industrial automation market. NPort IA device servers can be used to connect any serial device to an Ethernet network, and provide TCP Server, TCP Client, and UDP modes to ensure the compatibility of network software. NPort IA device servers are an ideal choice for connecting RS-232/422/485 serial devices, such as PLCs, sensors, meters, motors, drives, barcode readers, and operator displays to a network. All NPort IA models have a compact and rugged DIN-Rail mountable casing. Each NPort IA device server has two Ethernet ports for easy wiring. The ports are used to cascade two or more NPort IA device servers by connecting from one server to another with a standard RJ45 Ethernet cable. The cascading feature eliminates the need to connect each device server to an Ethernet switch. NPort IA device servers have dual power inputs that can be connected simultaneously to live DC power sources. If one of the power inputs fails, the other live source acts as a backup to support NPort IA device server's power needs automatically. The redundant dual DC power inputs give you extra assurance of non-stop operation. The built-in relay output function helps you to know the Ethernet link and power input status, and lets you check the web console to know which power or Ethernet link has failed. NPort IA can also send out a warning when an exception is detected. The relay output and E-mail warning function gives maintenance engineers a valuable tool for reacting promptly to emergency situations.